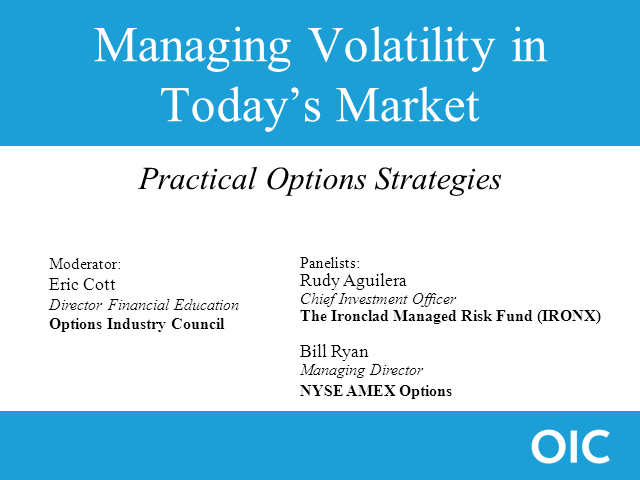 This session is designed for the investment advisor who is interested in incorporating options into their practice. Options are a powerful tool in building your business. They provide you with more alternatives and greater versatility for managing your clients portfolios. The speakers will discuss three strategies: covered call writing, protective puts, and the collar. The speakers will also provide some of the motivations behind using options strategies and some thoughts to consider when putting together a clients personalized plan for implementing these strategies.